While working on “Saving Audie: A Pit Bull Puppy Gets a Second Chance,” I naturally became concerned about the fate of the other Vick dogs. 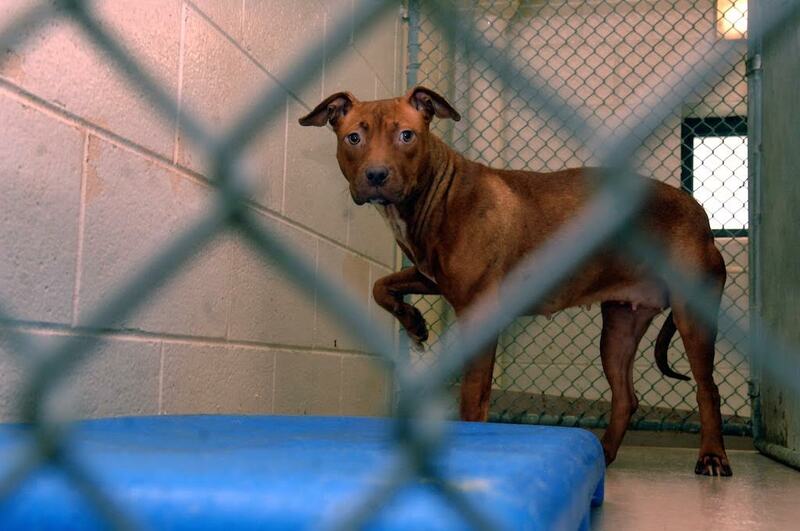 One image stood out in my mind, a photo of a thin, scared puppy from the Vick operation that appears in the book. Her face haunted me for months, and I couldn’t find out her fate. 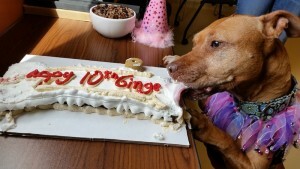 Then, one day, that sad neglected canine burst forth on Facebook with her own fan page–Ginger Girl, Public Figure. There she was, smiling for the camera and happily amusing her loving person, Stacy. 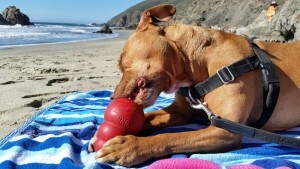 Now, Ginger Girl has the perfect life–trips to the beach, romps in the field, naps on the bed. What more could a dog ask for? 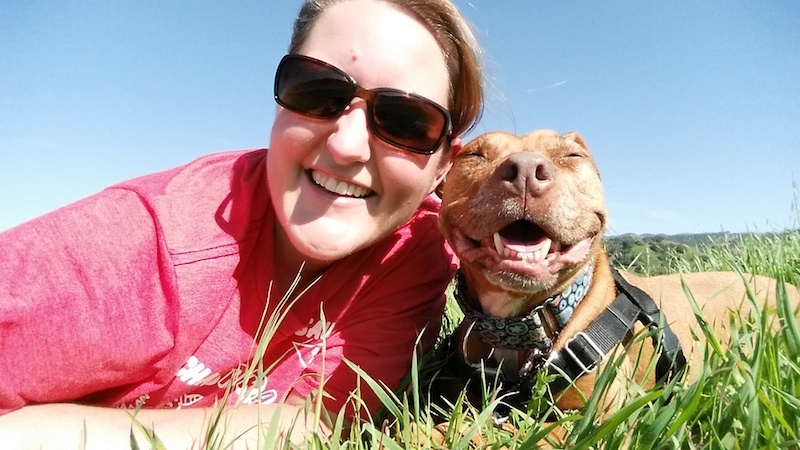 Well, dogs like jobs, and Ginger gets to go to work with Stacy, at the SPCA for Monterey County, CA. The most important part of her job is accepting treats from her co-workers at the shelter. Makes them feel good. Like many rescue dogs, Ginger is a bit shy, but over time she has conquered most of her fears with Stacy’s help. 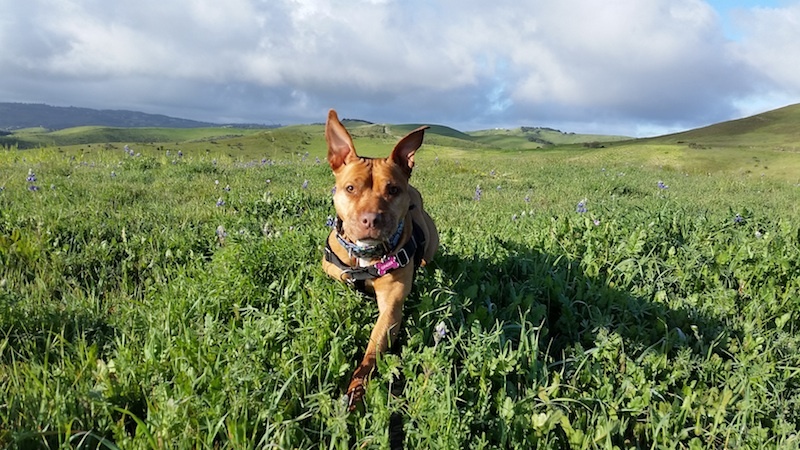 Her favorite activities, aside from graciously accepting treats, are taking naps, riding in the car, and hitting the trail. She could do without cameras and thunderstorms. 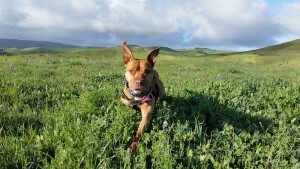 Last fall, I looked forward to the opportunity finally to meet Ginger as my husband and I began our long drive home to Montana from a winter in Oceanside, CA. Not only would I get to meet her and Stacy, I’d be able to join in her 10th “faux birthday” party. Of course we don’t know the actual birthdays of the Vick dogs, but birthdays are always fun to celebrate, and April 1 seems a ‘cool’ day to be born. Unfortunately, minor disaster struck, and our car’s clutch gave out on an Los Angeles freeway, forcing us to delay our departure and miss the birthday party at the shelter. 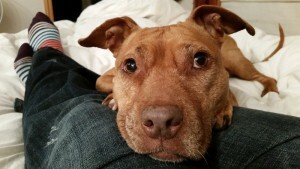 I could see from Stacy’s photo from the gathering that Ginger Girl wasn’t perturbed by my absence! Ginger’s such a sweet inspiration. And you tell her story so beautifully. Thanks for your comment, Dylan. She is so photogenic! And I’m hoping to get to meet her this winter when I’ll be back in California for awhile.